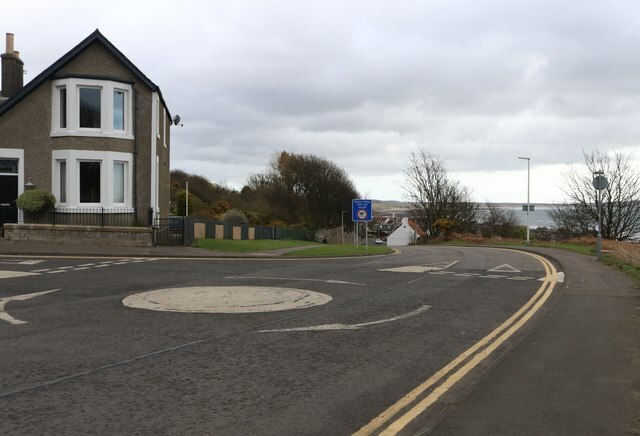 This roundabout, at the junction of Emsdorf Road (left) and Drummochy Road (ahead, and behind the camera) stands at the top of a hill and leads down to Lower Largo (ahead). NO4202 : Statue of Alexander Selkirk 1676-1721 This statue is of Alexander Selkirk, who was born in Lower Largo and served as the inspiration for Robinson Crusoe. The difference between him and the fictitious character is that he actually asked to be marooned on Juan Fernandez Island because the ship he was on was so bad. It sank soon afterwards, so he made a wise choice, but unfortunately he had to wait four years and four months before being rescued from the island.